As promised, Mommy and I put together a little tour of my new Toy Story themed bedroom – I *love* it, and it was a pretty easy redo. If you don’t want to watch the video – OR you already watched it and just can’t get enough – be sure to check out the pictures after the jump! As you enter my room and turn to your left, you can see my tall dresser. Mommy totally stole my dressers from Grammy Boo and Coach’s house when she was setting up my Very Hungry Caterpillar nursery; they used to be her grandmother’s. 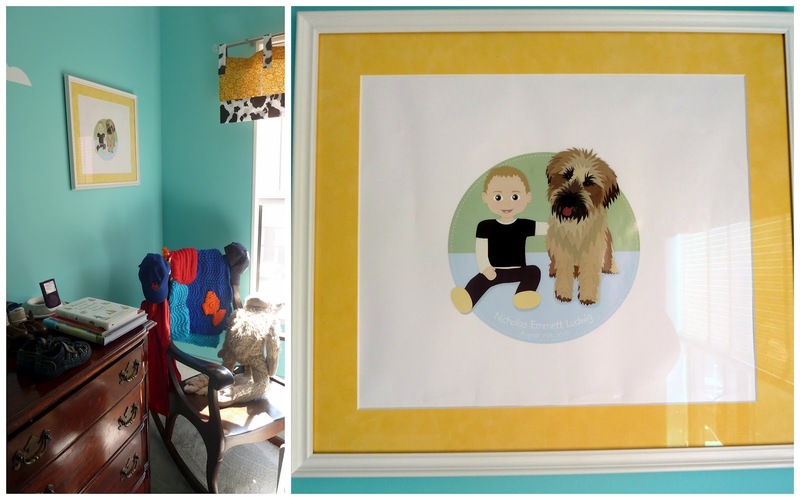 Hanging above the dresser is a section of the window shade Mommy’s very talented friend Jane made for my nursery. You can also see the Toy Story Mr. Potato Heads that WeeMason’s Mom got me. Past the dresser, my Army guys are parachuting down from the ceiling, and you can see my “I love you to infinity and beyond” wall art as well as a few of my vinyl stick-on clouds. Further down the wall is my custom illustration of me and Henry. You can also see the valance that Aunt Angela made me (you can find the fabric HERE and HERE, but you’ll have to get your own Aunt Angela). Above my bed is the bookshelf that Coach made me. If you don’t have a Coach of your very own (sad! ), you can find a similar one (not the same one that we were originally inspired by, which we can’t find anymore) at Pottery Barn Kids. The moon light we picked up at IKEA, and Grammy Boo got me my Toy Story pillow at Target, but they have some nice ones on Amazon. 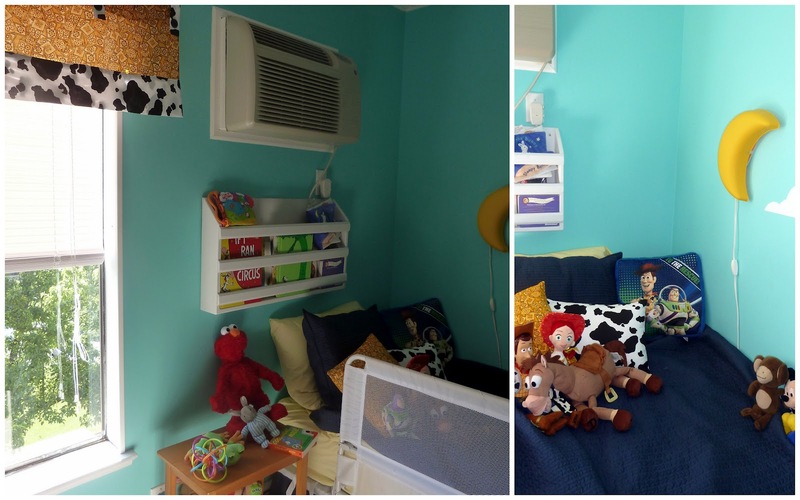 The idea to use IKEA spice racks as bookshelves is not original, but Mommy wanted them white so she decided to spray paint them – and then ended up on bed rest, so Coach got stuck with the job. Apparently, though, they were difficult to paint – they must have some coating on them – so you might want to keep yours the original wood if you put your own up. We organize with my sweatshirts with a row of hooks from IKEA mounted under the lowest bookshelf so the hooks are not poking out of the wall where they could hurt someone. I hope you like my Toy Story room! « Go to the movies with Mommy! Very nice! We did the Ikea spice rack shelves too! What an awesome room! So great!!! Love the moon light! Love that you found a way to keep the window shade since it was AWESOME! And I seriously LOLed at the “panning down now so you don't see the mirror since I'm still in my bathrobe.” Too funny! I love it! 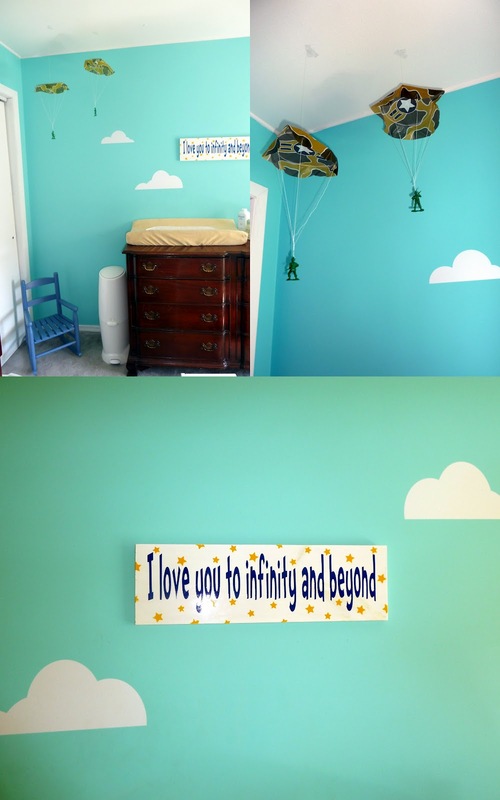 The clouds on the walls are so perfectly “Toy Story” you barely need all the other adorable stuff. And I'm jealous you found those spice racks – our IKEA is being renovated and they're out of EVERYTHING. p.s. I'm posting my house tour tomorrow, and although I didn't get a linky organized, PLEASE come leave this link the comments so people can check it out! I love this room! Spencer would be so jealous. The clouds turned out amazing and what a cute idea to have the army men coming down from the ceiling.